UPDATE: Just wanted to let you guys know that Bombay Ducks are actually a type of fish and not meat. They are called Bombil in Hindi and Marathi. You can get more information here. As a child, I hated fish, or so they thought. My mum and nana would try everything they could think of to try and get me to eat fish. Of course, I wasn't a stubborn child except where eating fish was concerned so they had their work cut out for them. Eventually they realized that the reason I wouldn't eat fish was that I was okay with eating fish but what I actually hated having to debone the cooked fish before eating. Ironically I didn't mind eating fried sardines and fried karli (silver barfish), the boniest of the varieties available here, go figure! So my loving grandma would patiently sit and debone the fish on my plate, which I would very willingly eat up. Oh, the memories. Wash the fish and pat dry. Lay the fillets out flat on a plate. Sprinkle the salt, turmeric powder, red chilly powder, lime juice and apple cider vinegar over the fish. Gently, turn over to make sure that both sides are seasoned. Its hard to give you quantities for the spices, since everyone has different preferences. I make sure that there is a little sprinkling of the spices on all the fish on both sides. Handle lightly as this is a delicate fish. 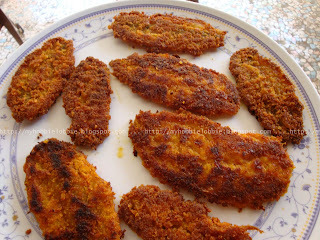 Sprinkle some chickpea flour over the fish on both sides till lightly coated. You can add a few drops of water to help you with this. The chickpea flour will help the fish stay together so please don't omit it. Since this is a delicate fish, leaving it out will result in the fish breaking up while you try to move it around in the pan. You don't want a thick layer or a chickpea batter coat, just a light sprinkling to bind it. Keep aside for about 15 minutes. Heat a couple of tablespoons of oil in a pan. Dredge the fillets in breadcrumbs to coat them well. This will give you a crunchy fillet. Shallow fry on a medium flame. Do not move the fish around in the pan, till a crust has formed on the bottom. Moving it to early will break the fish up. Once the bottom side has formed a nice brown crust, turn over and cook on the other side till done. This I have to try out. They look really crunchy which i really like. Thanks for sharing. I am your new follower. You can visit me at http://showmemama.com. Make sure you leave a comment so I know you visited. What a special dish. I have never had Bombay Duck, although I love Duck. The Duck looks delicious and the recipe is full of flavor. I would really like to try this sometime. Thank you so much for sharing with Full Plate Thursday and please come back! Thanks ... Miz. Helen, bombay duck is actually a type of fish. You can substitute other fish fillets like Kingfish for example and its really good. You sure are a lucky woman to have your nana debone your fishes as a kid, and now your husband to do the job for u! And those fillets sure do look yummy and crunchyy! yumss! This looks great! I've never had duck, although I'm thinking about trying it now. Thanks for sharing at What's Cooking Thursdays. Hope to see you there this week.